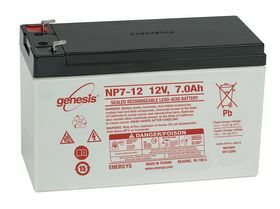 EnerSys NP7-12 VRLA 12 Volt 7.0AhBattery of the Genesis NP series is the most reliable and versatile maintenance free rechargeable sealed lead acid batteries available today in the market. NP7-12 VRLA 12 Volt 7.0Ahbattery's sealed construction allows it to be used in any position except inverted without leaking. It is completely maintenance-free and unaffected by storage. The battery has outstandingly good recovery after deep discharge. It has expected life span of 3 to 5 years in float service applications. This battery can be operated in a broad range of ambient temperatures. 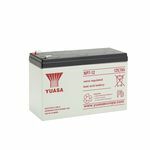 This battery can be used in many applications from small power surge uninterrupted powers supplies to children's ride on toy cars and much in between. If you are looking for quality and peace of mind, choose the Genesis NP range from EnerSys, the world leader in stored energy solutions for industrial applications.